The clinic PROCRÉA, specialized in reproductive health, began its activities in 2008. Based in Abidjan, it is now the leader in Côte d'Ivoire for medically assisted reproduction. PROCREA is the latest investment of the fund I&P Afrique Entrepreneurs 2 (IPAE 2), launched in December 2017. Popularizing this practice and making it accessible to the greatest number of people is at the heart of the vision of the clinic's founder and current director, Dr. Myriam Kadio-Morokro BROU. We interviewed her on her motivations, career choice and projects for PROCRÉA. Let’s start with a few words about your background? I studied medicine in Abidjan, where I did a thesis on the biology of reproduction. To specialize on the subject, I continued my training in France at the Pierre and Marie Curie Faculty of Medicine, where I completed several specializations in reproductive biology, sterility therapy and molecular cytogenetics. I worked in several UHCs, hospitals and laboratories. But my return to Côte d’Ivoire has always been an evidence. There is no reason that such fundamental practices should not be available in Africa! When I returned to Côte d'Ivoire in 2005, I decided to create a fertility center based on the European model but adapted to African realities. I proposed to Prof. Marie-Laure Attoungbré, pharmacist biologist, to join the project. Together we officially started PROCREA's activities in 2008. We were then joined by three other renowned health professionals in Côte d'Ivoire. What were your main motivations for embarking on this entrepreneurial adventure? 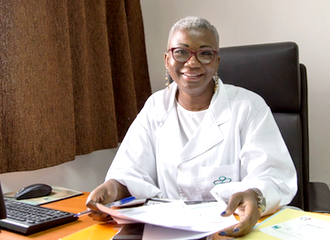 The entrepreneurial spirit is very present in my family... Basically, I did not see myself working as a civil servant, which is the usual career path for healthcare practitioners in Côte d'Ivoire! I have always believed that entrepreneurship is essential to improve people’s living conditions. It is obvious in the sector of reproduction: it is a research profession, which requires us to move forward with our time and take certain risks... Today I combine the two aspects of my activity, both of which fascinate me: practicing my profession as a doctor and managing the clinic as an entrepreneur. Can you tell us more about the medical context in Côte d'Ivoire? How has PROCREA evolved since its launch in 2008? PROCREA has already come a long way. Our team now counts 46 people, and we have accompanied over 500 couples, from Côte d’Ivoire but also from neighboring countries (Burkina Faso, Guinea, Mali, Senegal...). This represents a major achievement, because it means that the reliability and quality of PROCREA's services are recognized on a regional scale... Before our installation, this type of medical service was only available in North Africa or Europe. In ten years of activity, have you seen these taboos evolve? What role can a clinic like PROCREA play on these issues? Mentalities are changing, but it takes time. One thing is sure: the needs are real! PROCREA expands access to medically assisted reproduction while guaranteeing the same standards as in North Africa or Europe. Our patients are mainly from the middle class, and most of them would not have been able to afford to be treated abroad. PROCREA is the latest investment of the IPAE 2 fund, managed by Investisseurs & Partenaires. What are the main objectives of this partnership? I&P is the first partner of the clinic. It’s my brother who talked to me about I&P, while I was looking for new funds to expand PROCREA’s activities. I did not know about investment funds at that time, and I first inly considered “traditional” banks. But I had a hard time identifying people who really believed in the clinic's project! The meeting with I&P allowed me to restructure the project and in particular to focus on its core business: reproduction. We also received support on several technical aspects concerning the day-to-day management of the clinic: it was a real trigger for me, who was trained as a doctor! What advice would you give to future entrepreneurs? There is no recipe for becoming an entrepreneur. What matters most is to believe in what you do, in your dreams, and to make the right relations. It’s not a problem to make mistakes, but you have to know how to get around obstacles and be persistent!